This strawberry shortcake is one that my mother made each summer when the fresh strawberries started appearing in the supermarkets. It is our family’s most favorite summer time dessert and is lovingly called “Grammy’s Shortcake” by all her grandchildren. Growing strawberries is much easier than you might think! The plant is a perennial and comes back year after year. You can make this dessert one of two ways. Either make individual biscuit sized shortcakes and slice them in half and layer, or do it “Grammy Style” and make a four layer delight that is great for gatherings. Either way, the taste is delicious and the look is fabulous. 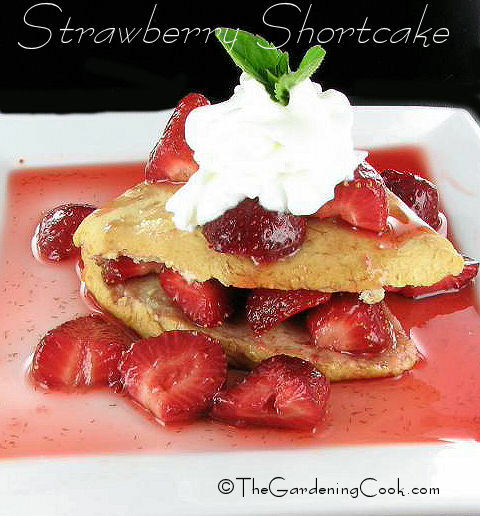 For more dessert recipes, please visit my Facebook page: The Gardening Cook. 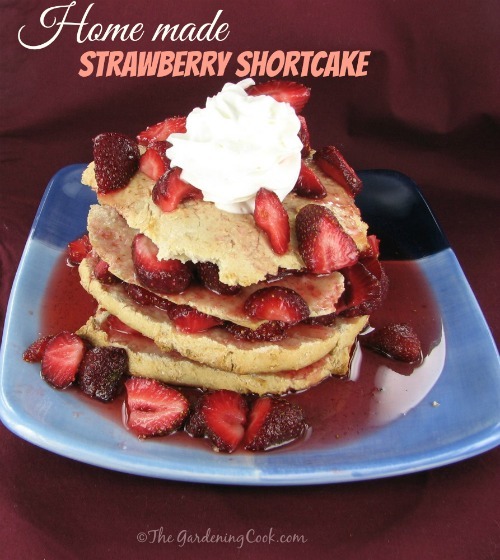 How do you make a strawberry shortcake? Is this one of your favorite summertime desserts too? Please leave your comments below. 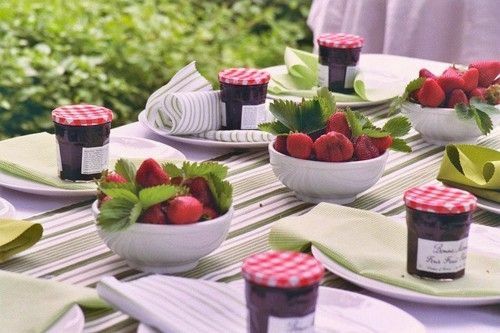 What fun would this shortcake be to serve on this strawberry themed table in the summer time. Image shared from Flickr. To top, sliced strawberries, a piece of fresh mint, and whip cream. Combine the Bisquick mix, 2 tbsp sugar, vanilla, and 2 tbsp of butter until a soft dough forms. Using your hands make two large balls. Place the dough balls on a greased cookie sheet and flatten them so they look a bit like a pizza. Cook in the preheated oven for about 20 minutes until lightly browned. Let cool slightly and then, using a bread knife, slice each shortcake in half through the center. Layer the slices with spoonfuls of the strawberries and syrup. You will end up with one tall cake with four layers of shortcake and strawberries. Add a dollop of whipped cream topping, a sprig of mint and a sliced strawberry to garnish. Can be adapted for vegan diets by using Silk light vanilla soy milk and Earth Balance Buttery Spread in place of the skim milk and butter. ← Have you got the Blues?